Did you know that the ghosts of feminists past haunt the halls of the White House? It was certainly news to us! 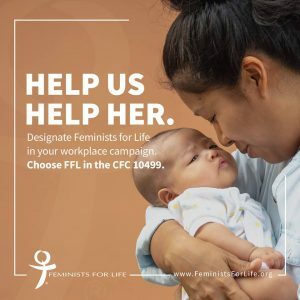 So when abortion advocate Rep. Nancy Pelosi praised our pro-life feminist foremothers in one breath and the “absolute” right to abortion in the next, we knew we had to respond. Emily Ward, of CNSNews.com, published a phenomenal piece yesterday correcting the record, citing our original pro-life feminist research, which shows that the same women who advocated for women to vote and slaves to be free also advocated for the rights of children, born and unborn. “As we approach the 2020 Centennial Celebration of the 19th Amendment, Feminists for Life of America is expanding our efforts to educate Americans of our rich pro-life feminist history. The first wave feminists were pro-life, but we didn’t know this until our co-founder, Pat Goltz, met Alice Paul (yes, author of the Equal Rights Amendment and the woman who successfully led the end of the suffragist movement to victory!). Paul told Goltz that although Feminists for Life of America was founded a year before Roe, we were not the first! “We proudly walk in the shoes of our first wave feminist foremothers who refused to choose between women and children. They knew, as we do today, that women deserve better and every child deserves a chance at life. Once again, Emily’s stellar work is here, and we ask you to share it with friends and family to spread the word: Pro-woman is pro-life! Unfortunately, not every media outlet is so thorough or honest. Feminists for Life is nonsectarian and nonpartisan and welcomes everyone of all faiths and no faith. Abortion is a reflection that we have not met the needs of women, and we work with those on both sides of a contentious debate to address the unmet needs of women. We were the only pro-life group to work in coalition with other feminists to pass the Violence Against Women Act and the Child Support Enforcement Act, the first to advocate inclusion of coverage for pregnant women and their unborn children in the State Child Health Insurance Program (SCHIP), and successfully stopped a mandate to include the so-called “family cap” in welfare reform. FFL’s Pregnancy Resource Forums were the inspiration for the Pregnancy Assistance Fund in the Affordable Care Act. Most recently, we have endorsed the Survivors’ Access to Supportive Care Act and the Pregnant Women in Custody Act, as well as measures to promote women in STEM and many other efforts. The core feminist tenets continue to include nonviolence, nondiscrimination, and justice for all. We invite peaceful discourse and joint efforts with unlikely allies and key stakeholders to address the unmet needs of women, such as housing, child care, maternal care, family-friendly workplaces, and on-campus solutions. FFL was founded in 1972, one year before Roe v. Wade. Respectfully, with a long record of pro-woman advocacy and work on campuses, we aren’t quite sure by what standard being a 46-year-old pro-life organization makes us “new,” unless you are comparing us to our first wave feminist foremothers, who were also anti-abortion. Furthermore, rather than being “anti-choice,” more accurately we are consistently anti-violence and promote the resources and support to advocate for eight different choices: marital, partnered, and single parenthood; kinship care and guardianship options; and open, closed, and semi-open adoption. See our website WomenDeserveBetter.com, which focuses on solutions as women Work, Learn, Live, and Love. Your diligence in correcting the record is most appreciated. We appreciate those honest journalists who do their homework and faithfully present all sides of complex, controversial issues, including feminist history and abortion. As someone with a background in journalism myself, it is as refreshing to read pieces like Emily’s as it is depressing to read the slipshod work of other outlets. P.S. It is because of donors like you that we are able to reveal our rich pro-life feminist history. We are in the middle of our fall campaign. Please help us reach the new generation to walk in the shoes of our feminist foremothers. Thank you.